We all can agree that nothing is more important than a good night’s sleep. But what if a warm pillow gets in your way? The answer is simple: toss it away! Get yourself a pillow that will grant you the greatest snooze of your life. And to aid you in this task, I’ve prepared a list of 7 best cooling pillows, each of which can surely become your favorite thing in the bedroom. Why Do You Have to Buy a Cooling Pillow? Are There Any Cons to Buying a Cooling Pillow? Why Do You Sleep Hot? Phase Change Material. Standard: 24 x 16 inches. King: 18 by 32 inches. Leather Trim. Queen: 20 x 28 inches. King: 20 by 36 inches. Cooling Gel. Standard: 17 by 23 inches. King: 18 x 30 inches. Cotton Cover. Queen: 20 by 28 inches. When I was browsing through shredded memory foam pillows, I chose this one because it allowed me to decide how much filling I’m going to use. And the second I placed my head on it and felt how comfortable it was, I knew that this one was going to be on the list. This model features a phase change fabric cover, which is why I believe it can be your cooling pillow for hot flashes. It will help you regulate your body’s temperature and have more peaceful sleep every night. 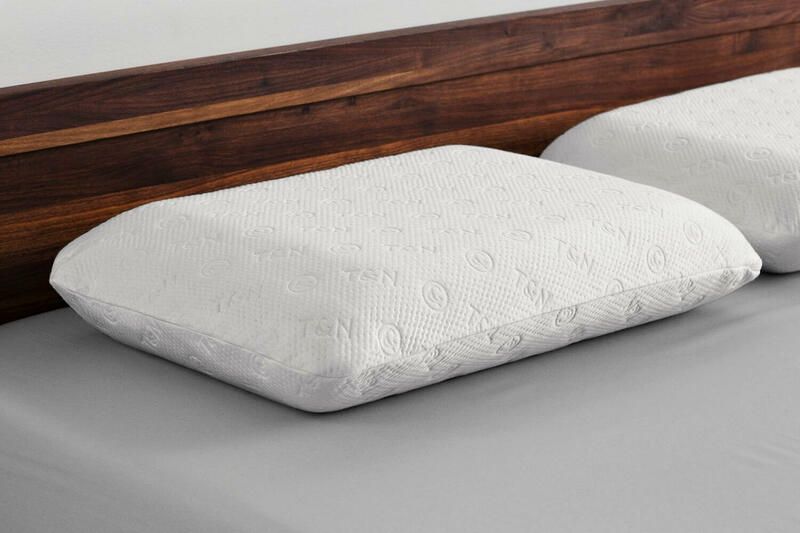 It is filled with removable memory foam that allows you to choose how thick you want your pillow to be. The cover comes with a zipper that allows for convenient refilling. The cover is made of polyester, which is really nice to the touch. The best thing about this pillow is how it stays cool all through the night. To be honest, I was rather skeptical about how chilling a cooling pillow can actually be. However, the result turned out to be fantastic, as I didn’t sweat at all during sleep. The worst thing about this item is that when it arrived, it had too much filling. Just one look at it, and I thought: “That won’t do.” But after a bit of experimentation, I’ve found my sweet spot. Of course, it was my personal preference, but I think some people might feel the same way. So, it’s just a heads-up for you. This pillow is plushy and offers decent support. With the cooling effect it provides, it will help you rest well every hot summer night. Ready to buy this trendy pillow? Do it here! This model is an upgraded version of the Helix pillow. Its cooling cover is what makes it one of the best cooling pillows on the market. Made from knit polyethylene fibers, it not only helps you stay cool through the night but also looks very neat and minimalistic. It managed to fit into my bedroom perfectly. The materials on the inside feel high-quality because that’s what they are. I would fairly name this item the top-rated luxury cooling pillow, as it looks, feels, and truly is a luxury model. There are two sizes available (Standard and King). The pillow features 2 removable layers made from memory foam and down alternative to adjust the height. The cover is made from a knit polyethylene fabric, which allows the air to circulate freely. There is a 1.25-inch gusset under the cover, on the top and bottom sides of the pillow. The company offers a 100-day trial period and a 3-year warranty. The thing I liked the most about this pillow is the combination of support and softness it can offer in multiple positions. You can take either one of the additional layers or the both of them to make the pillow perfect for you personally. The worst thing about this pillow is its shape retention. 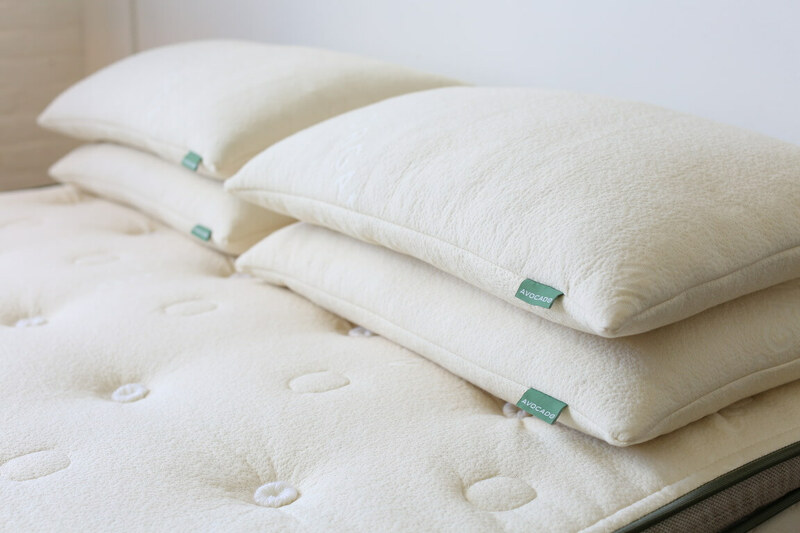 Typically, memory foam and down alternative pillows require frequent fluffing and tend to flatten out over time. I didn’t notice it with Helix, but I wasn’t using it long enough to judge. And since it’s a relatively new model, there are no long-term reviews to judge by other people’s experience. To tell you the truth, I was skeptical about this pillow because of its cost mostly. But after having some of the best nights of my life sleeping on it, I don’t think it’s overpriced anymore. Of course, there are cheaper alternatives, but this pillow is worth every dollar for it’s breathable, supportive, and conforming. Feel like this is your perfect pillow? Order it here! At first, I was a bit skeptical about how comfortable such a sturdy pillow can be, but I was pleasantly surprised by its feel. The gray knitted cover did provide a great deal of comfort, while the pillow itself adjusted perfectly to the shape of my head. What I really like about this model is the ventilated structure of its memory foam core. There are holes across the entire piece, which promotes better airflow and makes this model the most suitable cooling pillow for night sweats. If you still manage to get a little sweaty, you can remove the cover and throw it in a washing machine to easily ensure a hygienic sleeping environment. The cover features a ziplock that allows you to change the amount of filling. The gray knitted cover creates a luxurious look with leather detailing. The cover can be washed separately, which makes the process of looking after the pillow much easier. The coolest thing about this pillow is how firm and supportive it is. If you’re anything like me, you also want both: comfort and health benefits. And this pillow gave me both. It kept my neck in the right position, helped me relax the muscles completely, and simply felt great to the touch. The most unappealing feature of this model is the slight off-gassing. Thankfully, it was gone in less than a day. So, if you have a sensitive nose, you’ll have to air the pillow out for a couple of hours before starting to use it. This item looks stylish, provides a great level of comfort, and can be a perfect option for people who appreciate supportive and firm pillows. Another contestant to be called the highest-rated cooling pillow is this wool model by Plushbeds. It’s great for allergy-prone people, as wool is a natural material resistant to mold and dust mites. You need to be ready to take time for experimenting in order to finally find your perfect thickness. This is particularly suitable for people who don’t know for sure whether they sleep on their back, side, or stomach most. The cover is 400-thread count cotton sateen. The filling is chemical-free, pure virgin wool. Every pillow is hand-stuffed and you can choose the thickness level. The coolest thing about this pillow is how natural it is. Made from 100% wool, it’s a great option for people who prefer all-things-natural. Besides, the company is very transparent about the process of growing sheep and gathering wool, which I find really great, as I’m against animal abuse. The worst thing I’ve found about this pillow is its firmness. Wool is less conforming than, for example, memory foam, which is why the pillow might seem too firm for some users, especially stomach sleepers. Honestly, I enjoyed sleeping on this pillow quite a lot, and it felt perfectly supportive to me, although I wish it were a bit softer. If you have no problem with a firmer pillow, this is your best option! Ready to start sleeping cool? Click here to order your Plushbeds pillow! 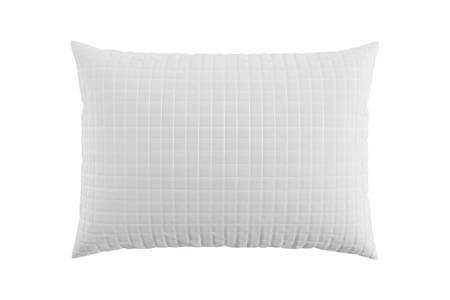 This pillow has made it to this list because of its proprietary memory foam filling. 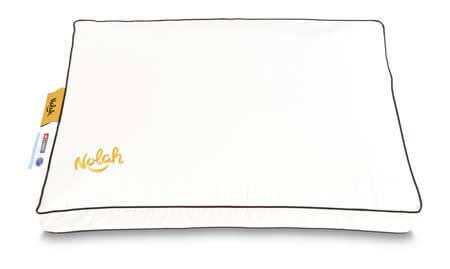 Nolah has designed their own memory foam formula that is much more breathable and cooling than the one used by many of its competitors. It’s not surprising then that they’ve called their blend AirFoam – it allows the air to circulate through the pillow and cool down your body during sleep. Apart from the cooling filling, the pillow comes with a breathable cotton cover for even better temperature regulation. The removable and washable cover is a mix of cotton and a cooling phase-change material. The proprietary AirFoam filling is very supportive but quite soft at the same time. The pillow is protected by a 2-year warranty. There’s a 120-night trial with an obligatory 30-night break-in period. The best thing about this pillow is how it cradles your head and neck. I was able to relax completely when sleeping on it. Being made from memory foam, it has naturally great conforming properties. That’s what I love about memory foam pillows, and this one wasn’t an exception. What I didn’t like about this model was the lack of customization options. If you toss and turn in your sleep a lot, like me, you would be much more comfortable with a queen or king size. But this model is only standard-sized. Besides, only one firmness option is possible and you can’t adjust the loft. Actually, it’s not much of a drawback. It just means this pillow is not for everyone. This pillow works very well to keep a sleeper cool. It conforms to your head and neck, helping your muscles relax. Note that this model is not adjustable and is most suitable for back sleepers. Want to give it a try? Place an order here! That was my first reaction when I saw this option, and try it I did. Surprisingly, I wasn’t disappointed, as this pillow turned out to be very comfortable. Although latex is naturally a more breathable and cooler material compared to, for example, memory foam, gel-infused memory foam is its decent opponent. However, some people hate the sinking feeling that cool memory foam models provide. If you’re one of them, this model by Avocado Green can be your cooling latex alternative. The cover consists of natural latex and cotton. The filling is made from organic Kapok fiber. The interior structure of the pillow allows for excellent airflow. You can choose from three sizes (Standard, Queen, and King). The worst thing I’ve noticed about this pillow is how thick and sturdy it looks. However, this small issue can be resolved by simply taking some of the filling out. So, when the pillow arrives, don’t be alarmed by its size. You can fix it in no time if you don’t like it. The coolest feature of this pillow is how customizable it is. It not only comes in three different sizes but also allows the users to adjust the amount of filling, which means it can be easily customized according to your preferences. This cooling pillow really found a place in my heart. Not only is it made from natural materials, but it also has both softness and support to provide you with a good night’s sleep. Want to try it yourself? Order it now! This pillow has all the right to be on this list. It is safety certified and features the unique adaptive foam filling, which provides both support and cradling effect for your head and neck. This foam is responsive and rather firm, which most side sleepers would appreciate a lot. However, it’s 5-inches thickness and softer feel make it a great pillow for combo sleepers who turn from one side to another and often switch from side to back sleeping throughout the night. Made from the new-generation memory foam that feels softer and more comfortable. The infused cooling gel provides heat resistance. The pillow is very lightweight and pleasant to the touch. The worst thing about this pillow is that it might be too thin for some users. Because the foam in the filling is quite soft, and the pillow itself isn’t too stuffed, some sleepers (especially the heavier ones) might find it to be too thin and not supportive enough. The best thing about this item is the cooling effect it provides. The pillow’s design allows the free airflow, which makes it super breathable. I tested it without my AC being on, and it did its job really well: I didn’t sweat at all during sleep. Overall, I enjoyed using this pillow. It is soft, cradling, and supportive enough. Plus, the cooling effect it provides is simply undeniable. 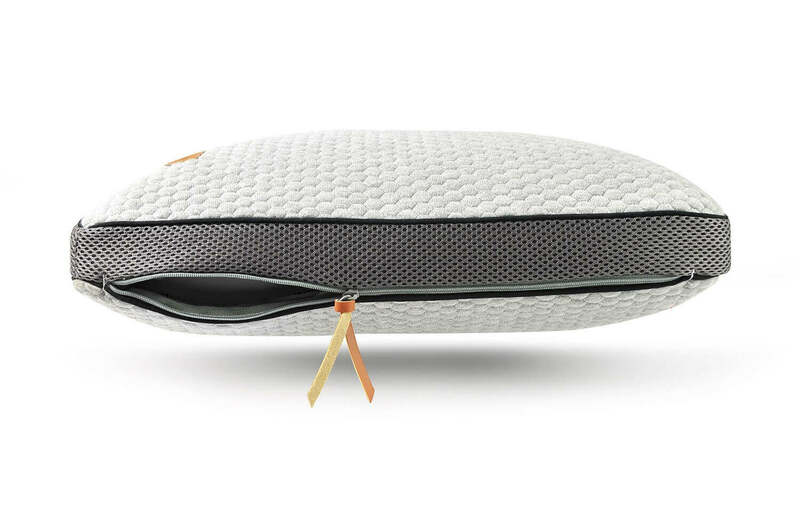 Eight Sleep have named this model “The Cool Pillow”, and this name does suit it. It will help you forget about night sweats for good. This pillow features an unusual, adjustable design. There are three layers you can not only add or remove to adjust the height but also put in a different order to find the perfect firmness for you. Despite this adjustability, I personally have found the pillow to be most comfortable when I was sleeping on my side. 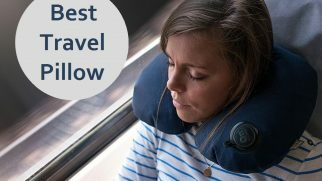 It’s thick and supportive enough to let me call it the best cooling pillow for side sleepers. The pillow features a cotton cover and a shredded memory foam filling, which make for great air circulation and cooling effect. Three layers inside the shell allow you to adjust the firmness and height. The manufacturer provides a 10-year warranty and a 30-day trial. 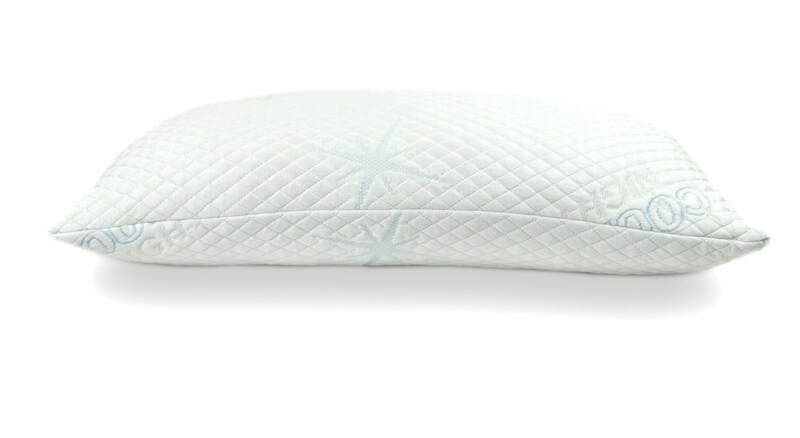 What I liked about Eight Sleep pillow the most was its adjustability. For people who are unsure what position they sleep in or for combo sleepers, who change positions during the night, this is a perfect option. It’s really comfortable for side sleeping, but I believe it can suit any sleeping preferences. The most annoying thing you might notice about this model is the off-gassing typical of the memory foam pillows. Compared to other memory foam pillows I have tried, this one has a bit stronger odor, which might take quite some time to disappear. It did eventually air out, so it’s not much of a big deal, just something to keep in mind for people with sensitive noses. The fact that you can configure this pillow to suit your personal preferences makes it one of the most customizable models on the market. I had fun testing it and was able to find my comfortable configuration rather quick. Want to get one for yourself? Click here to order! Natural materials (buckwheat or bamboo). Memory foam. Such pillows adjust to the form of your head and neck, which contributes to the pressure relief. However, memory foam pillows are usually quite dense and heavier than their alternatives. There are also pillows that are made from the shredded memory foam. Such an option is more lightweight and is easier to mould to your liking. Another benefit of this design is that it allows better airflow, thus offering a more efficient cooling effect. Gel fiber. This material provides great airflow and can be easily washed. 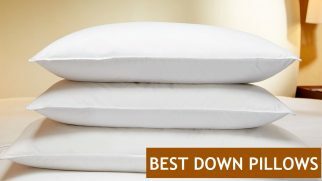 Such pillows offer excellent support for your head and are also softer than the memory foam ones. They are pleasant to the touch and feel just like a regular pillow. Natural materials. For the cooling effect, the most popular natural pillow filling is either bamboo or buckwheat. They both are eco-friendly and hypoallergenic, which makes these types of filling perfect for people who are sensitive to smells, chemicals, and some other materials. First of all, if you’re anything like me, then having a hot pillow under your head is almost like sleeping in an oven. You can’t relax completely, and you wake up in the middle of the night to flip the pillow to the other side. Luckily, most of these problems can be solved by buying a pillow with a cooling effect. For me, such a pillow is essential during long summer nights, and even more important for anyone who resides in a hot climate. Several studies suggest that a cooling pillow not only offers more comfort but also can help people with insomnia or other sleep disorders. Cost. Compared to regular pillows, cooling ones are placed on the more expensive side of the price scale. The reason for that is mostly the use of additional materials, such as a cooling gel or a natural bamboo layer, which requires additional expenses on a manufacturer’s side. Weight. Cooling models ‒ latex and foam ones in particular ‒ tend to be heavier than non-cooling ones. This is not a major drawback, but it can make it harder to fluff and adjust the pillow to your position during sleep. Off-gassing. The majority of pillows with a chill-down effect are made from memory foam. It is known for its chemical odor, which can sometimes remain really strong before airing out completely. Or, it may never fully disappear at all. That’s quite possible for low-quality models. Maintenance. Cooling pillows that feature a one-piece design typically don’t tolerate machine washing. Of course, you can clean them manually, but it’s not always as effective. Apart from that, you should keep in mind that the choice of cooling pillows on the market is somewhat limited. Even those models that are advertised as having cooling properties might not always sleep cool in reality. If you’re living in an area with a hot climate, it’s quite natural that you sweat at night. But what if you don’t? What are other reasons people get hot during sleep? You can also sweat because of medications. Aspirin and other drugs taken to lower fever often cause sweat. Besides, sweating is a common side effect of antidepressant treatment. With all of that being said, visiting a health professional is highly advised if your night sweats are not connected to the physical environment and have become an ongoing issue. Picking among so many great options was not an easy task for me. All seven pillows have pleased me with their heat resistance properties, and thus deservingly found themselves on this list. However, there was one item that stood out for me the most, and it’s the Avocado Green Pillow. Why should you choose it too? The pleasant color, the fact that manufacturers only use environmentally friendly materials, the ability to refill it to your preferred size – altogether, these factors allow this pillow to be called the best. And how do you deal with those warm summer nights? Do you simply turn your AC on? Or do you believe that a cooling pillow is enough? Share your thoughts in the comments! The Avacado green pillow has got a nice rating, I’ve been suffering from serious heat especially in the head. If I can get a supportive pillow, it’ll be way better. I’ll attempt the purchase of that green pillow because I like tge features and specifications.